Material Handling - Sage Automation Inc. This Material Handling System features a Fanuc Articulated Arm Robot, Model #R2000-165f with a clamping style fork end effector. Other material handling equipment in this system also includes pallet conveyors, a divider conveyor, and a product infeed conveyor. Sage Automation also designed, implemented and installed perimeter guarding including the following; safety fencing, light curtains, and gates with interlocks for Lock Out Tag Out procedures. Cartons enter the system from the press stacker on the infeed conveyor. 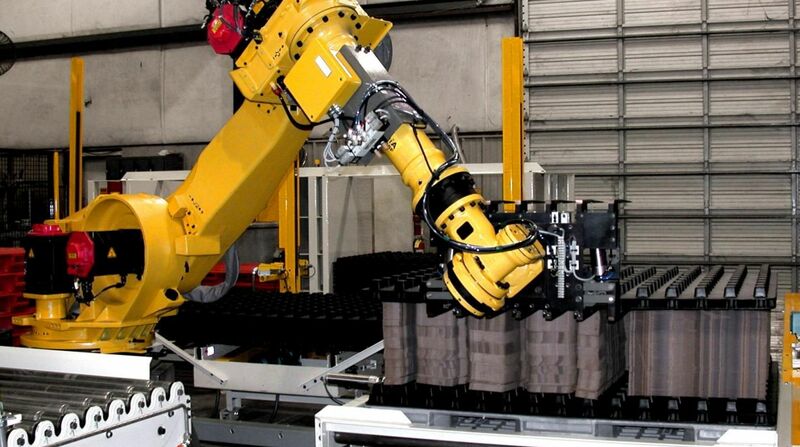 The Fanuc robot will then pick the number of stacks needed to build a layer for the gluer machines to handle. Prior to placing the stacks the Fanuc robot will pick a pallet from the pallet conveyor, and place it on the discharge conveyor. The pallet will be justified on the conveyor by an active mechanism on the conveyor. After a pallet is placed, the Fanuc robot will pick a divider to place on that pallet. The Fanuc robot will repeat this step every three or five stacks depending on the die number of the carton. The Fanuc Robot will qualify the cartons in the qualifying wall then palletize the stacks until completing the pallet load. After this is done, the Fanuc robot will signal for the conveyor system to remove the full pallet. Loads are ejected out of the robot envelope on the load conveyor. Sage Automation is an Authorized Fanuc Integrator who can design and implement automation systems to solve your most complicated material handling problems. Sage Automation follows ANSI and RIA Regulations/Guidelines on all projects involving Fanuc Robots, ASRS Gantry Robots, and various automated equipment. Please contact Sage Automation for help with all of your Industrial Automation projects.